Hi! I’m Melinda from Tales of the Sassy Teacher. Today, I am super excited to come to you as a guest blogger on Rachel Lynette’s blog! As a fan this is such a great honor. I want to share with you something that I have started doing in my classroom that has really helped me with my field trips. 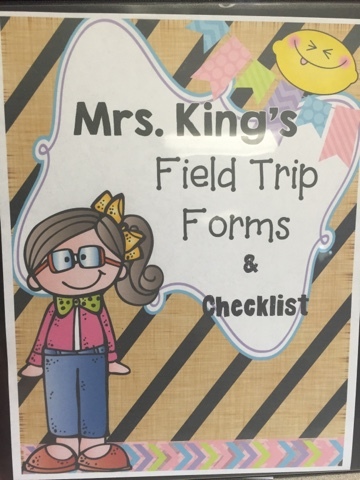 It is a Field Trip Form and Checklist Binder! Now if you hate binders, you are probably saying, “OH GOSH! NOT ANOTHER BINDER!” But, if you are like me, you are jumping up and down and yelling, “WOO HOO!!!! A BINDER!! !” Let me tell you how this all came about. I had always sent home forms and collected the money. I checked it off on a checklist that I generically made in my attendance book. I kept them all paper clipped together in the top drawer of my desk until the field trip was over. I would come back from the trip and throw it out. Now, close your eyes and imagine the horror of these papers being waded from the drawer or me accidentally moving them to another drawer and forgetting that I had done this. Picture the panic at night of, “Did I mark that child as paid?” The panic of asking kids (who never remember), “Did you pay for the trip?” Yes, this has been my life for 15 years. I decided to take control of the madness and create something that would help me not look like a crazy person. Thus, the Field Trip Binder was formed. Let’s talk about the three things that can help you with getting organized in the right way. You need a heavy duty binder. This will be super important. You will be carrying it around with you. It needs to be strong enough to deal with the bumps and bangs of a backpack or a bus ride. Why would you really need this binder? 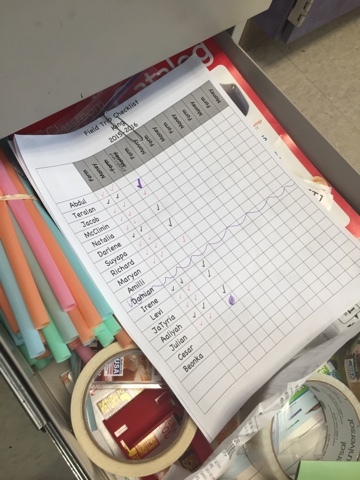 Let me just say that when you are organized, it really does change the way you deal with things in your classroom. 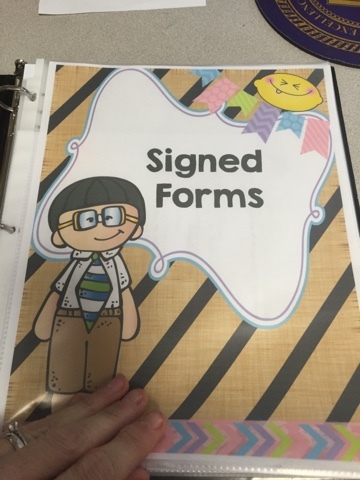 This binder will help you keep up with money, forms, emergency contacts, receipt forms (if your school has you use them), and it will help you have peace of mind. Now, I know what you’re thinking: You are telling me all this, but what does this look like? That leads us into #3. Let’s go over some of the items that I have in the binder and why I have them. 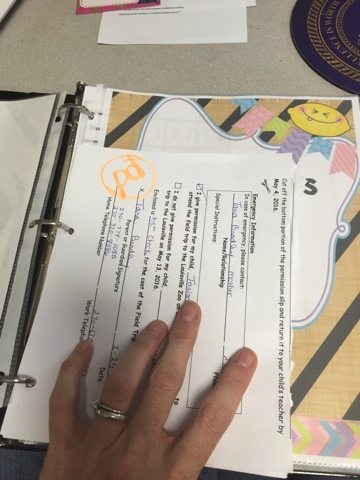 The first section is the signed forms from my students’ parents. This is an obvious section. When I place them in this section, I place them in a number order. 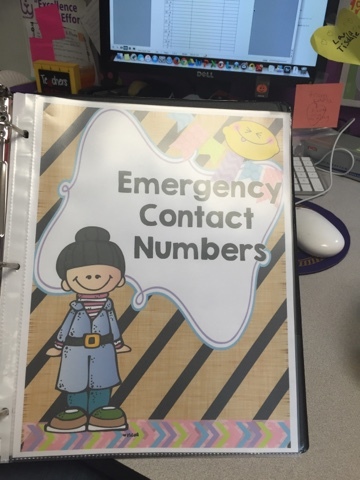 At the beginning of the year, I give each child a number for everything. So when I file their forms, I mark them paid and place the signed forms in this section. The next section is the checklist. This is a simple document on which I mark the signed form and money paid. I just put a plus sign or a check mark. I mark which places the forms are for, as well, such as the zoo, which you will see in the pictures. 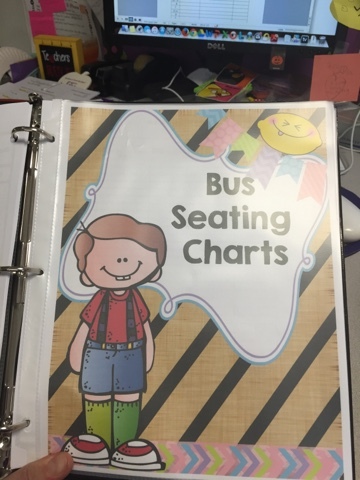 The next section is the bus seating chart. 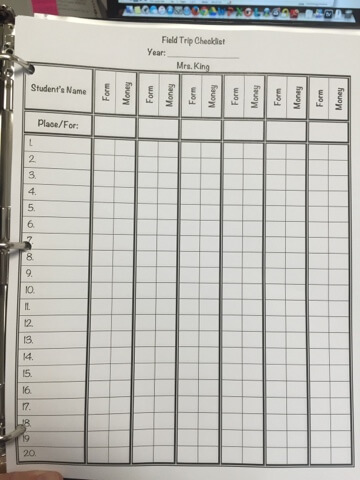 I keep seating charts that I prepare at the beginning of the year, as well as a blank copy. 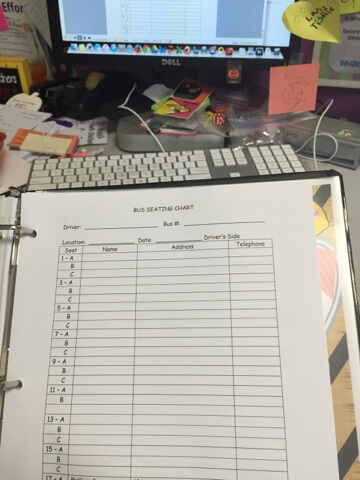 Sometimes, when new students come to my class, I have to adjust, so having them saved electronically helps so I can quickly make changes and print to add to the binder. The next section is the money receipt forms. 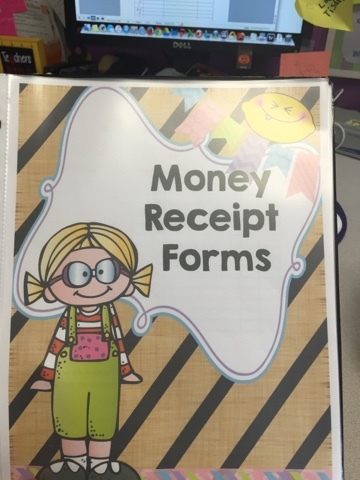 I don’t know how your school works, but at my school we have a receipt form we MUST turn in documenting our money. 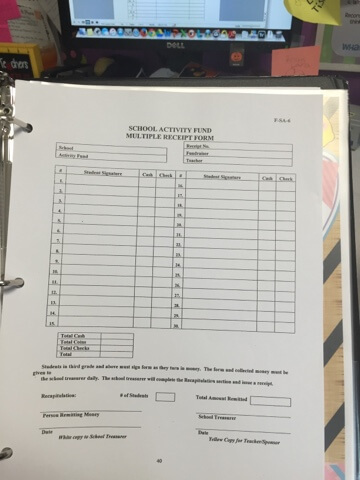 I keep blank copies in this section so that if another teacher needs one or if I need it, then it is always available. The next section is my extra field trip forms. 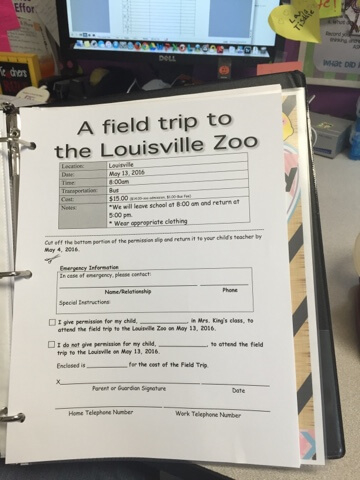 I always have a parent or a student who asks for another copy of the field trip form. I try to keep 5-10 copies of the current trip’s form in this section. This is a life saver and saves me from rushing to the copier. The last section is my emergency contact section. This section is just what it says it is. On my field trip forms, I have emergency numbers. I keep those numbers on notebook papers in this section. They are easy to access at any time. 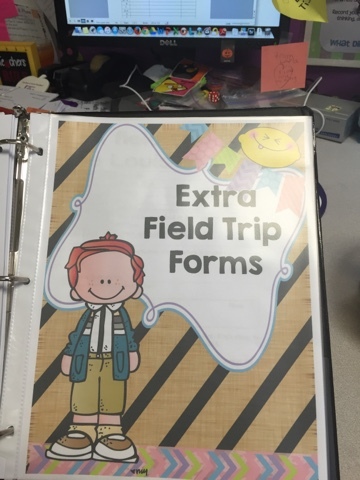 This field trip binder will travel with me on our trips and help keep me organized. As you can see, this binder can be very helpful. If you love it, then I have a surprise for you! This is a forever freebie in my TPT store. Just click HERE, and you can now download a copy of this for yourself. The forms are in there, as well. If you want to make anything electronic, just use a text box and type. This has been such a wonderful time sharing with you. I am so excited that you stopped by and decided to hear about my corner of the world. I am honored to have been a guest blogger! Thank you Rachel, and thank you for stopping by! Melinda King is an elementary teacher who has been teaching for 16 years and is addicted to amazing clipart. Her love is to encourage learners to have a growth mindset and for them to see that they are more than what the world says. She allows them to use their creativity in all they do in the classroom. Read more her on her blog, Tales of the Sassy Teacher, follow her on Facebook, Instagram, or see her resources on TPT.